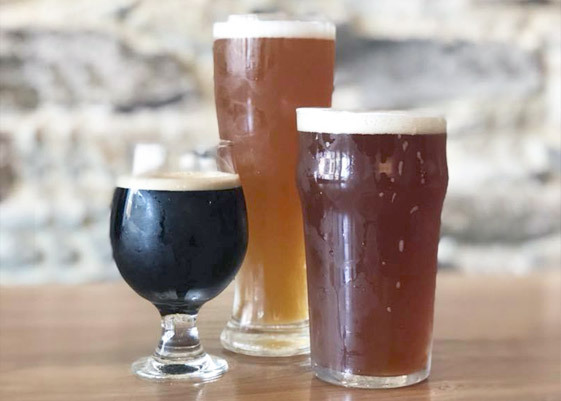 Our brewing process begins with purchasing malts from a nearby Delaware company, Proximity Malt. Malt varieties are selected according to the style of beer to be brewed. Our brewing system has an innovative design. It consists of two single-vessel brew kettles. 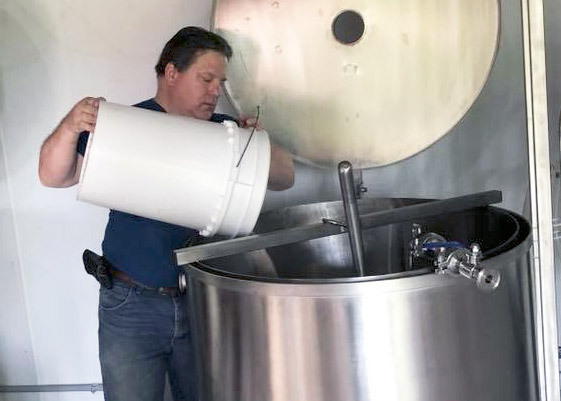 Inside each brew kettle is a stainless basket which contains the malt. Each brew kettle can produce 3 barrels(bbl) of beer. 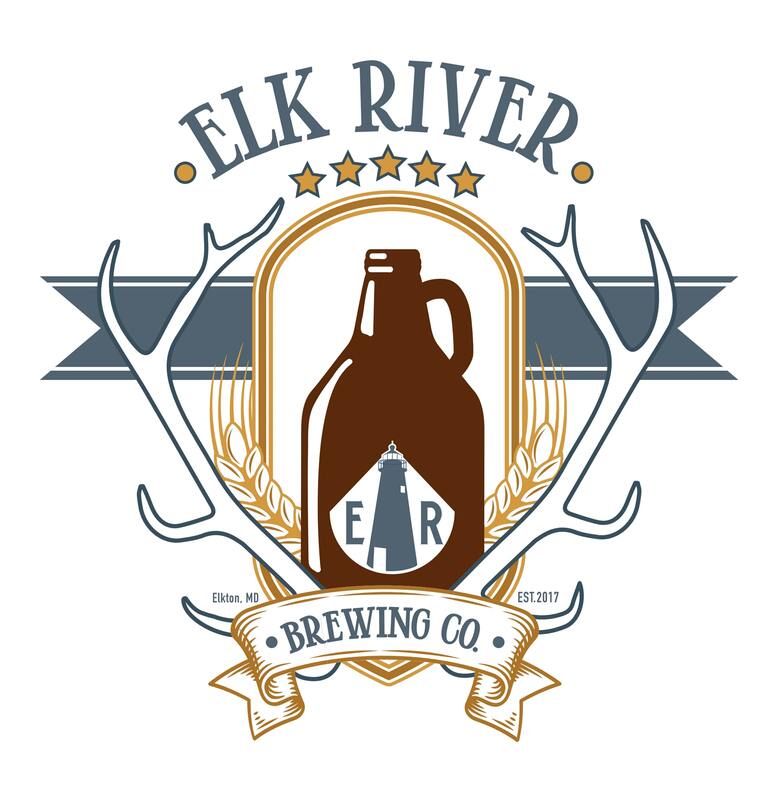 Our system allows us to brew a single 3-bbl batch, two separate 3-bbl batches or one 6-bbl batch all at once. The grains steep inside the brew kettle at about 150 degrees for an hour. 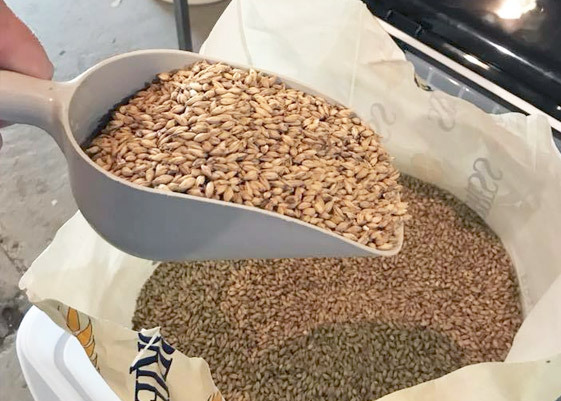 This is the mashing process in which the natural enzymes from the malt break down the malt’s starch, converting it into sugar. After an hour of mashing, the grain basket is slowly hoisted out of the kettle, allowing the hot, sugary water to drain out of the bottom. During this process, we also add more hot water to the top of the grain bed to further rinse sugars from the grain. Rinsing the grain is known as sparging. This creates a sweet liquid collected in the brew kettle known as wort. We boil the wort for an hour and add hops during the boil. Hops are a spice that add bittering flavor as well as floral, spicy or citrusy flavor and aroma to the beer. Once the boil is complete, we transfer the wort through a heat exchanger and into a fermentation tank. This process cools the wort to 70 degrees. Once the chilled wort is in the fermenter, we pitch yeast to start a fermentation. 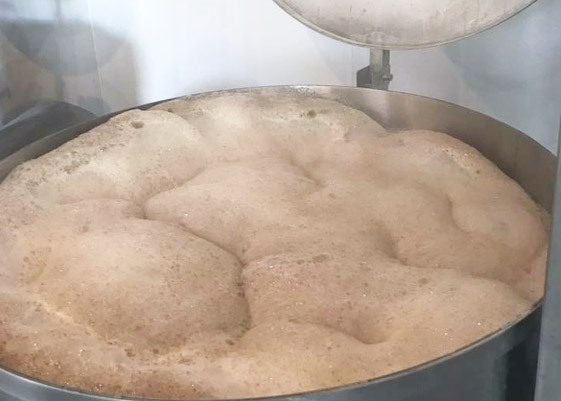 The fermentation period typically takes two weeks in which yeast converts the sugary wort into alcohol and carbon dioxide. Once fermentation is complete, we keg the beer and store it in our cold room. 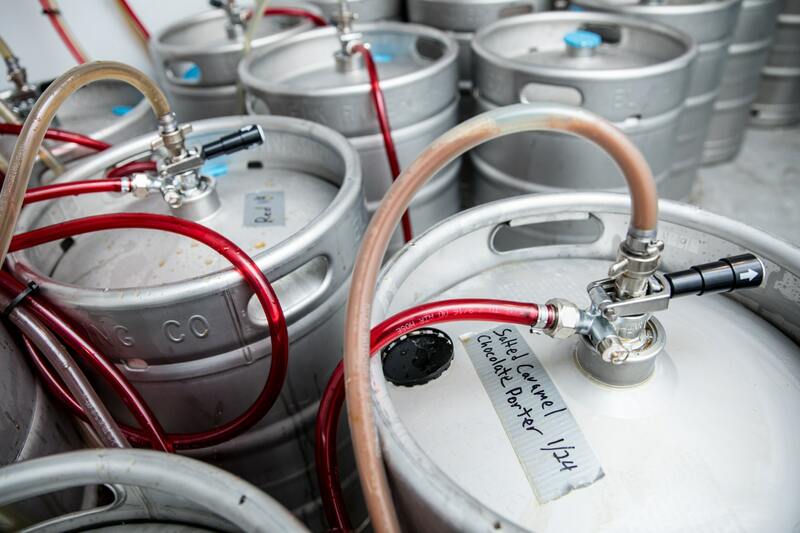 We then tap the kegs in the cold room and serve it upstairs in our taproom!